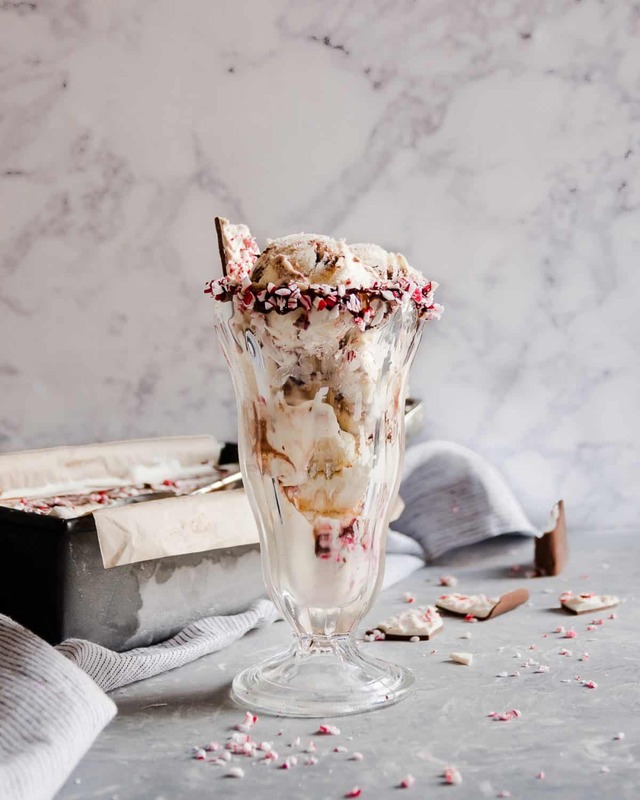 No churn peppermint bark ice cream is a perfect warm weather Christmas dessert recipe! “Christmas ice cream? Are you crazy?” No. I am not even a little bit crazy for suggesting we make Christmas ice cream a thing. First of all, ice cream is without a season because it’s delicious. Second, this cold weather Christmas business idealized by Norman Rockwell paintings isn’t the norm for about half the world. First of all, it’s summer for the southern hemisphere, and the closer you get to the equator, the more likely anything below 70 is considered “freezing”. My very Floridian parents were having brunch at the beach this weekend and complaining about the cold… a frigid 72 degrees Fahrenheit. Christmas ice cream is incredibly appropriate. 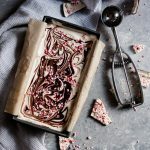 And since this no churn peppermint bark ice cream is also super easy, we really have no reason not to whip up a batch and pretend we too are beach brunching, right? 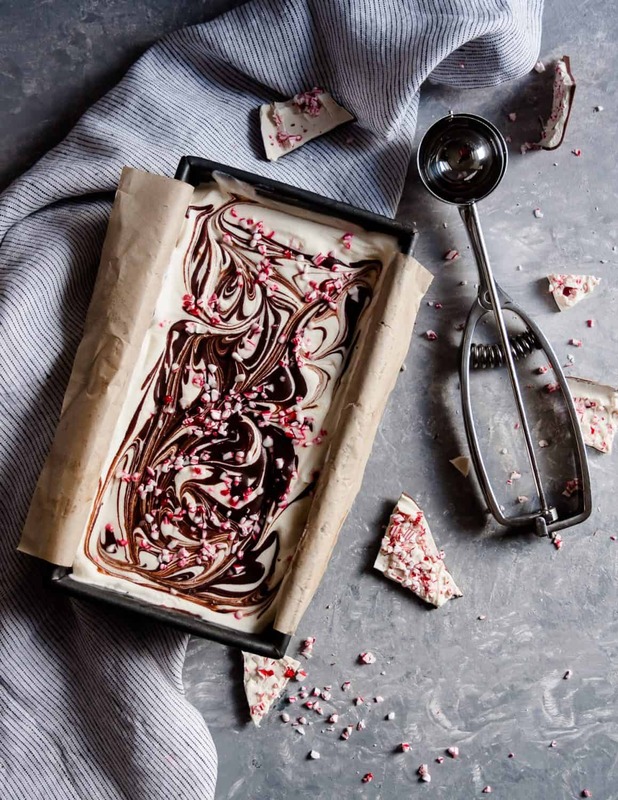 This chocolate peppermint ice cream recipe doesn’t actually have any bark in the ice cream. The reason for this is that chocolate turns incredibly brittle when frozen in ice cream, so instead, we get our chocolate from a rich chocolate ganache. 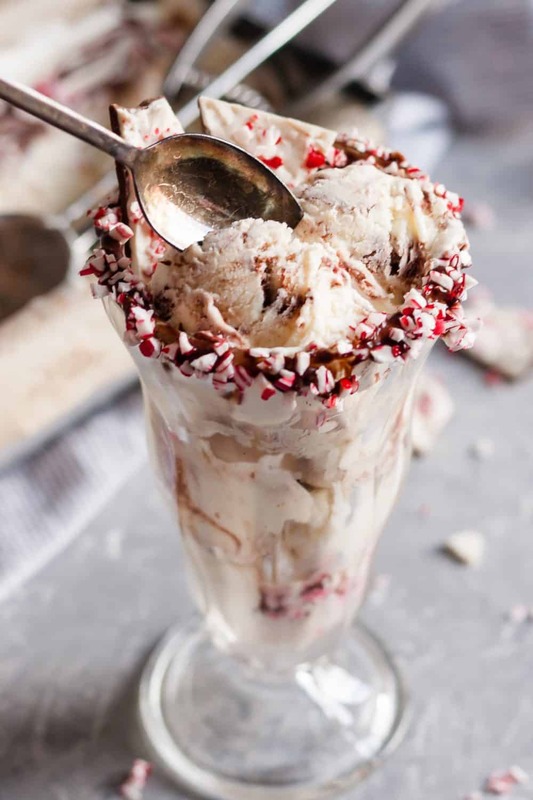 A little peppermint extract ensures we have a nice mint flavor, and then topping the ice cream with some crushed candy cane sprinkles makes it festive! 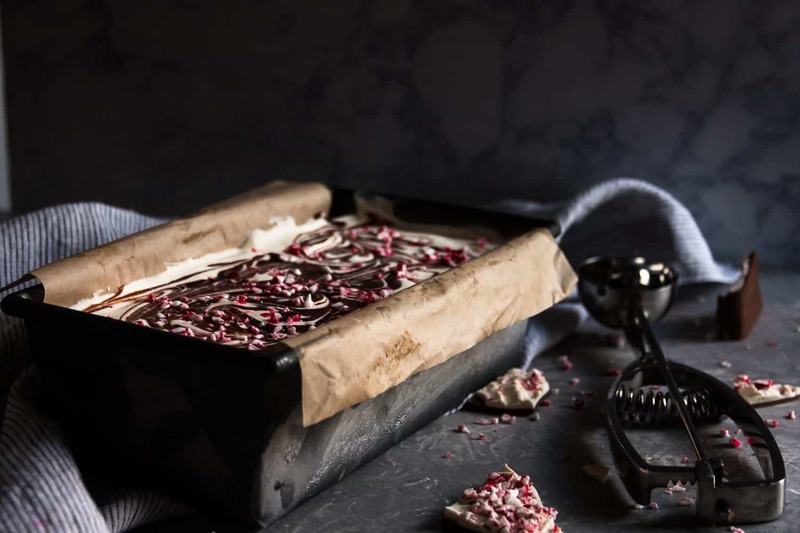 Speaking of festive, serving the no churn peppermint bark ice cream in rimmed bowls or ice cream cups is super fun. 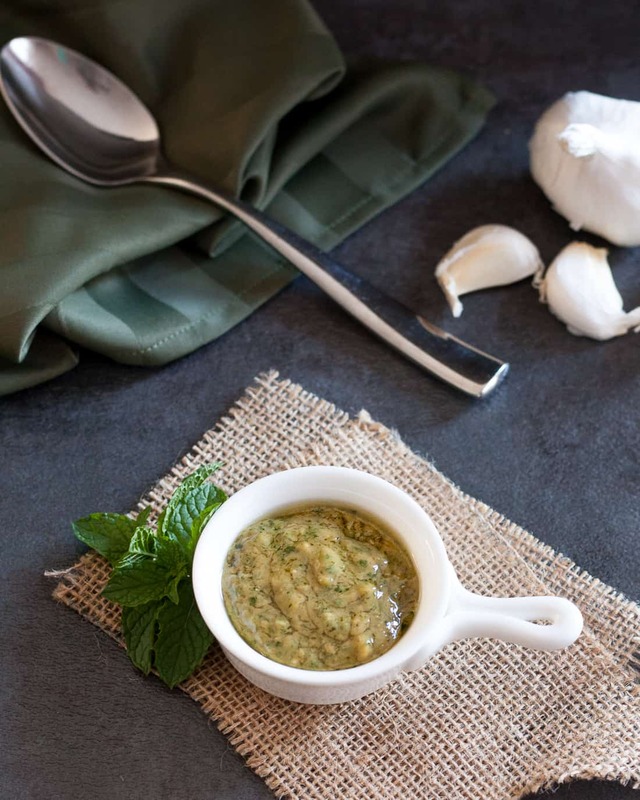 To get the look, dip the bowl or cup into a little warm chocolate ganache or a bit of chocolate syrup, then dip in crushed peppermint candies. Then fill with ice cream and serve! You’ll want to top the ice cream with some extra candies and a few pieces of peppermint bark too, of course. Enjoy! Melt together the ganache ingredients using a double boiler or the microwave. 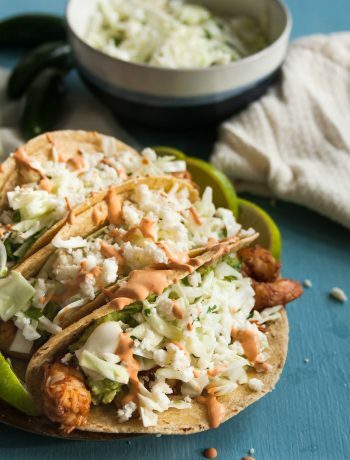 If using the microwave, start with 1 minute at 50% power, then stir, and use additional 20 second intervals as needed until smooth. 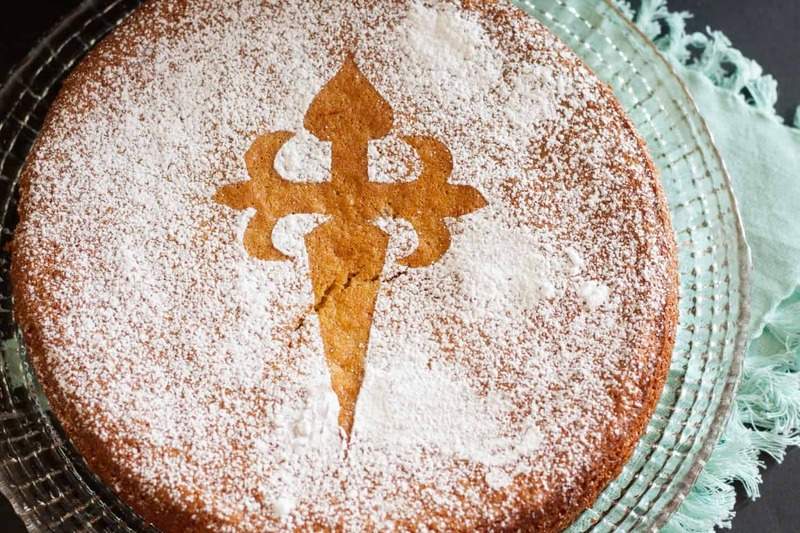 Set aside the ganache until it reaches room temperature (about 10 minutes). If you're pressed for time and moving on to making the ice cream base immediately, refrigerate the ganache and it will cool enough while you are making the base. In a stand mixer fitted with the whisk attachment (or a large mixing bowl using a hand mixer), whip the heavy cream until stiff peaks form. Fold in the condensed milk and peppermint extract. In an ice cream container or loaf pan, layer 1/2 of the ice cream mixture along the bottom of the pan. Top with half the room temperature ganache. Top with the remaining ice cream, and the remaining ganache. Use a chopstick or butter knife to swirl the ganache through the ice cream. Top with crushed peppermint candies and freeze until solid, about 1 hour. To maintain maximum freshness, press a piece of plastic wrap over the top of the ice cream while in the freezer. Enjoy within a month.